The direct to tape analog recording is available at Rhapsody Analog Recordings (www.rhapsodyanalogrecordings.com) on both 180 gram vinyl and 1/4 inch tape. Acknowledging your heroes is common in the jazz world. In our new DXD live in the studio series we have asked a select group of European top musicians to recreate one of their favorite albums in their own image. It all began with the blues. Ask any musician based in the tradition of american popular music: no blues, no jazz. 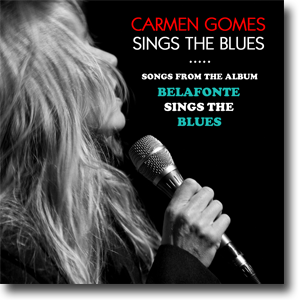 That Carmen Gomes Inc. would take on the challenge of reinterpreting Harry Belafonte's 'Belafonte Sings the Blues' was originally suggested by Harry van Dalen, owner of the eminent High End audio shop Rhapsody. He thought that Carmen’s band would be perfect for reinterpreting the mood and the sound of the classic album. Carmen immediately loved the idea. 'Belafonte Sings the Blues' was one of her favorite albums when she as a kid spent countless hours listening to music and making cassette tape compilations from her parents vast LP collection. "I had a 60 minutes tape that I made consisting of my favorite songs from the Sings the Blues albums of Harry Belafonte, Nina Simone, Ray Charles, Memphis Slim and Muddy Waters. The tape eventually broke and got eaten by the machine, that's how much I played it!" Carmen recalls. So when confronted with the task of making the arrangements of the songs for 'Carmen Gomes sings the Blues', I first recreated Carmen’s 60 minute tape for inspiration. Since my recreation was in the digital domain, it was not possible to wear out the tape, but I did listen to it extensively. It became clear to me that in order to capture the spirit of those blues albums, I would have to keep the arrangements as simple as possible in order to give the musicians the opportunity to play straight from the heart. Some songs were kept close to the original arrangement, while a song like the 'Way That I Feel', was completely reharmonized. Others like 'Hallelujah, I Just Love Her So' had the form extended in order to create more space. Muddy Waters’ Mannish Boy, while not being on the album is paraphrased in the introduction to 'God Bless The Child' and 'Losing Hand'. The 11 songs were recorded live in the studio in front of a studio audience. When an audience is present, a synergy occurs.The audience becomes part of the music making and help spur the musicians on to greater heights. And it was a great audience that afternoon, all ears and smiles, the whole band truly enjoyed playing for them. Harry van Dalen called the result breathtaking. Also head engineer Frans de Rond was happy as well, he didn’t need to repair a single note. The legendary Studio 2, situated in the the building of the Dutch Music Centre of Broadcasters (MCO) is the oldest recording studio in the Netherlands and has hosted a wealth of prominent artists; Django Reinhardt, was there in 1937, Jazz at the Philharmonic featuring Ella Fitzgerald in 1953, and in the 1960’ Wes Montgomery, Clark Terry and Eric Dolphy all recorded in the studio. We recorded in DXD 352,8khz and simultaneously, using analog equipment, direct to a Studer A80 Reel to Reel tape machine. As they are not ''separated'' by the headphones, the musicians, in order to hear each other are forced to create a natural and musical balance, a balance which is then easily captured by the main stereo pair of microphones. Because of this natural and musical balance the need for compression to control levels is no longer necessary, and since everybody is in the same room, the boxed sound which is so common in many modern recordings is absent. The studio has to have a good sound. We have to be very precise placing the microphones and the musicians at the right distance to the main stereo microphones and the right distance to each other. And with a live audience in the studio, we pray that they remember to turn off their cell phones and that the ones with a bad cold choose to stay at home. Recorded at MCO Studio 2, Hilversum, The Netherlands on November 14th, 2016. Cover photo by Vincent Carmiggelt. Studio photos by Michael van Polen.